I had two full days (three nights) in Athens. After spending just about a full day in transit, I arrived at the hostel pretty late the first night. Fortunately the rooftop bar was open for the first night of the season so I headed up there and managed to find some Kiwis who were really nice and gave me some tips for the next day. The ticket to see the acropolis also included entrance to six other main archaeological sites. My new buddies had tipped me off that the acropolis was open till 8pm and all the others shut at 3, so after getting my ticket I set off to try and work my way through them all. First up was the Ancient Agora (marketplace), which included a museum in the Stoa and also the Temple of Hephaestus, the best preserved temple there is (this is as descriptive as it’s gonna get). Next was the kerameikos, the ancient cemetery, by which point I was not coping with the heat and hat to go and look for a hat – €20 later I’m not proud to say I fell into a tourist trap – but at least I had some shade! Next up was the roman agora, followed by the Temple of Olympian Zeus. After that I headed back to the hostel for a siesta before tackling the acropolis at 6pm – his was the perfect time to go as there were no crowds and it wasn’t too hot! The acropolis east the main reason I went to Athens as I studied classics at school so wanted to see what I’d studied, basically. it’s been a while so I’d forgotten a lot but I still had a few little titbits come back to me! After spending a couple of hours there and at the theatre of Dionysus I headed back to the hostel, hung out at the bar for a bit and then went to bed. The following day I went on the walking tour organised by the hostel with all the other girls in my room (it was only offered on alternate days so I couldn’t do it when I first arrived, unfortunately). It was backtracking over old ground a bit given I’d seen a lot of the stuff the day before, but the guide was fantastic and the tour went for five hours – he kept apologising for going over time (it was meant to be around 3) but none of us were bothered in the slightest! After the tour we split up and I went to the acropolis museum, where I was most excited to see the real caryatids from the erechtheion. The exhibit of the Parthenon frieze and metopes was also impressive, but apart from that I only saw one sculpture I’d studied – kritios boy – and no vases, which was a bit disappointing. After that I headed to the panathenaic stadium, an ancient site which was rebuilt for the first modern Olympics in 1896. I wasn’t going to go in but ended up doing it just to fill in time, and I’m so glad I did – for €1.50 entry, the audioguide was fantastic and had a lot of information. There was also a tunnel under the stadium which opened up into the old changing room area which is now a ‘museum’ of all the past Olympic torches and posters. That evening I went out for dinner with the girls from my room – Kristen and Liz from Portland, Vannaa from Thailand but now living in Wellington, and Josh and Debbie, also Americans, also at our hotel. Kristen had found a place that did banquet-style meals for groups so with a group of six it cost €14 each and we could choose 14 out of 16 possible dishes, and water, wine/soft drink, bread and dessert were all included. It was awesome! 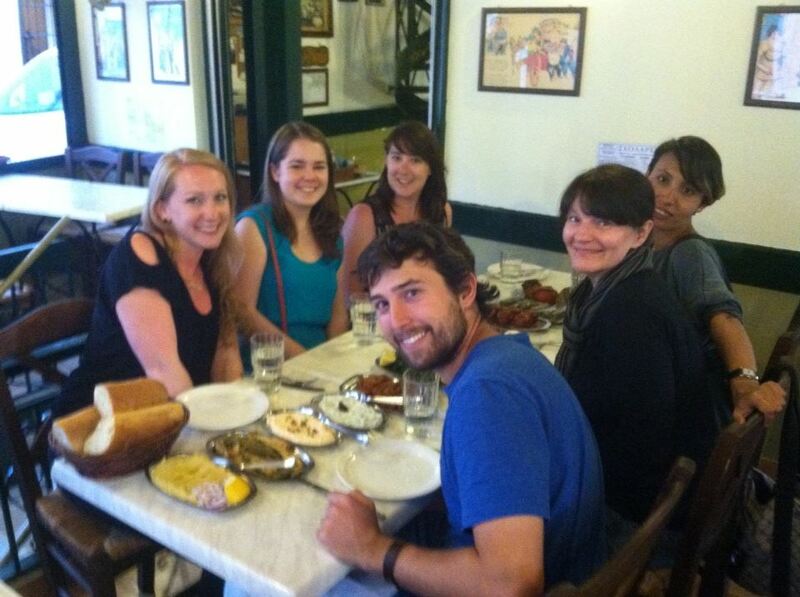 The crew and the spread – thanks to Kristen for the photo! The next day was off to Budapest and once again I seemed to spend most of the day travelling despite the relatively short flight. I arrived at my hotel around 5pm and then headed off to explore Buda, the castle district. Budapest is made up of two (formerly separate) cities – Buda, which is on the hill on one side of the Danube, and Pest, the flat area on the other. Buda has fantastic views over Pest and houses the big palace which is now home to several galleries and museums; and the Matthias church and the Fishermen’s Bastion which are the other main monuments. The next day was the big day as I was having lunch with family who I’d never met before. I was picked up at my hostel by my ‘cousin’ David and his friend Kristian, who took me on the most terrifying car ride (with the loudest music) I have ever been on. Nonetheless I arrived in one piece and was welcomed by Eva, her daughter Monica and sons David (18) and Joszef (26), and her other daughter Evi, whose kids were Zsombi (9) and Fruzsika (6), and the rabbit. They were lovely and gave me some presents before settling down to a huge meal which I struggled with as I had just been out to brunch with some guys at my hostel! For starters we had some kind of chicken broth with ‘noodles’, a Hungarian specialty which is sort of knobbly pasta lumps (I know I’m really selling this) then the main was paprika chicken with more noodles and salad, before dessert of a massive pancake cake filled with cream, jam and chocolate, and other cakes and fruit. I also started the meal off with a shot of palinka, particularly potent Hungarian fruit brandy which I had been warned about but could hardly say no to! It was pretty gross but not as bad as I was expecting. After spending a couple of hours there it was back into town and I met up with Tom and Francis, the two Brits in my room at the hostel. We headed to St Stephen’s basilica where we climbed the dome, but unfortunately couldn’t see the preserved hand of St Stephen (patron saint and first king of Hungary) as its ‘opening hours’ were over, so I had to come back later to see that. Then we went to a tiny local restaurant before having a drink in one of the main squares. The following day I went to the Great Synagogue, the largest synagogue in Europe (actually the first synagogue I’ve ever been to) and the museum about the Jewish history in Hungary. Then I went on a tour of the parliament which was a really beautiful neo-gothic building. I also went to the House of Terror, a museum set in the building which was the HQ of both the Hungarian Nazis (Arrowcross) and later the communists. Although it wasn’t exactly cheerful it was a fantastic museum; very modern, comprehensive, and a great insight into what went on. 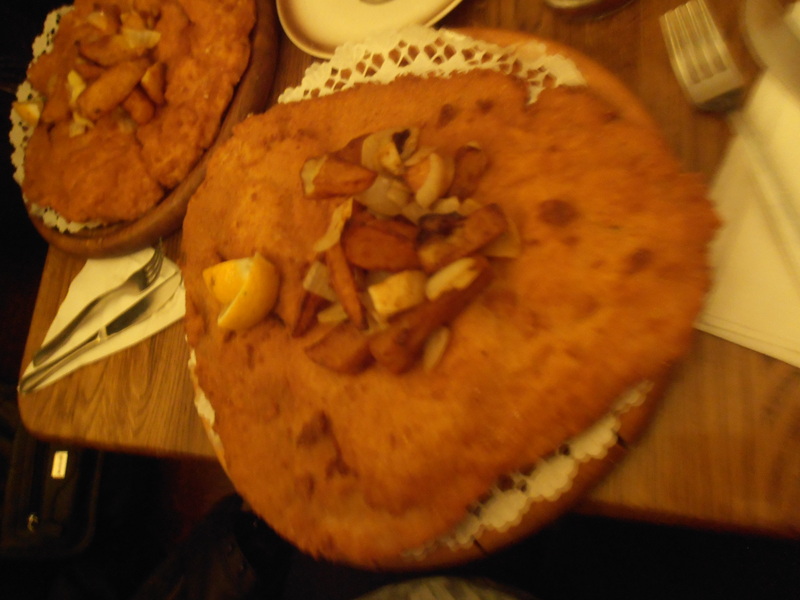 That evening was the start of my TopDeck tour and the whole group, about 40 of us, went out for dinner at a restaurant which specialised in giant schnitzels. About three of the guys managed to finish theirs, although none of them looked exactly happy about it! We then headed to Szimpla Kert, one of Budapest’s most famous ruin bars which popped up in old disused buildings. I don’t have any photos but it was a really cool place, kind of half outside, half inside with graffiti-d walls, fairly lights etc. My final day in Budapest was pretty relaxed. I’d checked off just about everything on my list, so I meandered down to Great Market Hall, a big indoor food hall – much like les Halles in France, with a second level of non-food stalls as well. I then spent an hour or so at the National museum which had a big exhibit on the History of Hungary, which I really tried to be interested in but I’d just had enough by that point. After checking out the ‘shoes’ memorial to the Jews along the river, I headed back to our hotel to cash in my free entry to the thermal baths. Budapest is renowned for its baths and we were staying at the Hotel Gellert, which is connected to one of the biggest baths. We then did our own thing for dinner, which ended up in about twenty of us descending on one restaurant who were not at all equipped to deal with us, with the final straw being a bill which was just a list of all the prices, not itemised at all. After popping by the ice bar (which was COLD), I headed home for an early-ish night before our first drive day, to Vienna.